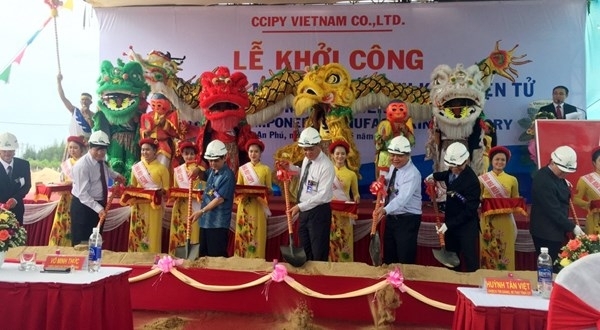 The CCIPY Vietnam Co., Ltd, a member of US-based Coilcraft Group, started construction work on a factory manufacturing electronic components at An Phu Industrial Park in Tuy Hoa city, central coastal Phu Yen province on May 13. It is the first factory of its kind located in Phu Yen. It has a designed capacity of 500 million items per year and mainly produces RF wirewound chips and electromagnets, all for exports. Director General of CCIPY Vietnam Koo Heng Sheong said the 5.7-million-USD factory is part of Coilcraft’s goal to develop production in Asia. The facility, which covers an area of 2.7 hectares, will be put into use in January 2018, offering job opportunities for about 2,000 local workers.